· Must the number be "permanent? " with the proviso, of course, that it can be removed easily if necessary. · Do staff members remove tags before placing items on exhibit? · Do exhibit designers object to visible numbers? · Are your collections stored under water pipes, in a basement, or any other area where they might be damaged by water? · Are some of your collections permanently stored in liquid? · Are insects a problem in your museum? · Do you need a simple inventory control tool? · Are you using a computer database? Or hand-written accession logs? Or both? · Who is applying the numbers? Are they skilled craftspeople or occasional volunteers? Rather than one solution for labeling all ethnographic materials (or any museum materials), proper labeling requires a palette of options for a skilled practitioner. You must choose between writing on the surface of an object or attaching something, such as a tag, to an object. For example, the least damaging, and best able to survive a water-related disaster, is a tag. However, there are choices about the type of tag to use, too. And what do you do if your object has no holes, knobs or handles on which to attach a tag? Also, a tightly attached tag may cause distortion, breaks or surface wear. Some museums successfully track their collections using only acid-free tags. This approach works when the museum registrar can control the activities of art handlers, exhibit designers and others who may handle objects. Tags may work, too, if there are clear institutional rules that everyone abides by because the museum director believes in them and actively enforces them. However, the less control you have, the less likely that tags will survive for long. Don 't waste your money on tags if the entire museum staff does not respect their purpose. There are several tag types. The most common is the white, acid-free paper tag with white cotton string. This tag comes in a variety of sizes and shapes and has a number of advantages and disadvantages. Among the advantages are the soft string, the ease of applying numbers in ink, and the pH neutral nature of the acid-free paper stock that is used. Always test each new shipment with a pH pen or pH strips before using. Among the disadvantages are the white fibers that cotton string can leave on artifacts and the propensity for oil to wick from objects through the cotton string to the paper, causing ink to run. In addition, these tags are also noticeable (which some museum professionals consider unacceptable), they provide a food source for insects, and they do not withstand immersion in water. Some suppliers use synthetic strings, though this is not noted in their catalogs. Always test tag strings before using. A cotton string produces ash when burned, but a synthetic string melts. Avoid nylon string; it deteriorates and damages artifacts. Be creative and do not accept white cotton string as your only tie option. If this string is objectionable, consider the alternative of cotton embroidery floss in colors that match your objects. Remember to test for color fastness. Dip the embroidery thread in water and press it against blotter paper, white paper, or cotton toweling using weights. Let it dry, then check for any color that transferred. If you think that other liquids or oils might come in contact with the thread when it is attached to an object, test the thread in each of these, too, for color fastness. For outdoor objects or oily objects (such as birds, grease dishes and seal skin), choose a tie that will not wick or deteriorate. The same approach is needed for museums with chronic pest problems or that store objects in less than ideal locations. One option is teflon monofilament, which is available as Glide unwaxed dental floss in the United States. Do not substitute other dental flosses without a barrier. They are multi-filament nylon and will deteriorate. A museum in Canada orders skived (a method of cutting Teflon into thin sheets) Teflon - an inert fluorine compound - from the manufacturer precut into set widths. The museum feeds the Teflon through a Dymo labeler and easily prepares tags for outdoor use and for wet archaeological pieces. Narrow strips of Teflon also work well for ties. A less expensive tag material for outdoor or wet use is Tyvek, a polyolefin. Although longevity may be a problem due to the inclusion of possible additives such as anti-static coatings, small museums on limited budgets recycle white fibrous Tyvek mail envelopes or Tyvek House Wrap from construction sites to make tags. If budgets permit, buy Tyvek from a reputable supplier, without any additives. It can be purchased as a soft fabric or a stiff "paper." The soft version makes an excellent tie, the stiffer version is easier to write on. Tyvek materials tend to carry a slight static charge, which could be problematic and should be tested if you are considering using the material on an object with flaking pigments or fragile paint. Also, some inks may float off the Tyvek surface when wetted; test before use. Metal tags, such as aluminum plant tags, work well in a dry climate or insect-infested area. They do not require a writing ink; accession information is pressed into the surface with a pencil or Dymo labeler. However, they must be considered carefully as they may scratch object surfaces and promote corrosion (metal to metal degradation). Metal wire and nylon ties -- such as fishing line, some plastic lock straps, many strings and most dental floss -- must be isolated from objects with polyethylene plastic tubing. Otherwise they will cut into surfaces and when they deteriorate, will cause damage to that area of the object. Tubing alone can also be used as a tie, but do not use poly (vinylchloride) (PVC) tubing (Tygon is one brand name) for anything under any circumstances whatsoever. PVC tubing is tempting because it is soft and flexible, however it deteriorates forming chloride byproducts such as hydrochloric acid. Some of the plastic ties that come with garbage bags may be inert plastics. Check with a local supplier, or do a burn test comparing them with a known, acceptable plastic. Zap straps, zippies or interlocking straps sold in computer stores and in automotive and electrical stores may be another option. Most of these are nylon, meaning you cannot use them directly on objects. Some may be polyethylene or polypropylene and can be used; read the package labeling carefully. Consider coated wires. Some telephone wire is coated with polyethylene, an inert plastic. As with all plastics, test or read the package before using. If the plastic is hideously bright, it can be toned down with acrylic paints. Seal the ends with wax or by melting the plastic closed, so that the metal does not scratch or corrode and stain the object. Do not use a rigid, strong tie or tag in contact with an object that has a soft, fragile surface. Try to make sure that the tie or tag is as soft or softer than the object so that if the two were rubbed together the tie or tag would be abraded, not the object. If you decide to apply catalog numbers directly to objects, rather than using tags, there are three methods to consider: (1) applying a label to the surface; (2) writing directly on the surface; and (3) applying a barrier coat, then the number. (2) Avoid numbering over paint or pigments. (3) When in doubt, use a tag. (4) Do not apply a stiff material to a flexible surface. (5) Disasters happen. Remember, barrier coats and labels will float off objects immersed in water. Use tags as a backup system. Labels with pressure sensitive adhesives are generally discouraged. Commercial labels, no matter what the supplier promises, will deteriorate with time. Many have a rubber-based adhesive that will yellow. Some, especially those touted as "acid-free," have acrylic adhesives that will cold flow into your object and can be impossible to remove with time. Labels made by a conservator, using a known adhesive formulation, may work in the short term, but could cause trouble with time. Few polymer-based adhesives really stand the test of time. Only wheat or rice starch paste, following formulations used to repair paper for centuries, can be recommended. Be careful with this method; excessive water may stain organic materials. However, pH neutral rice paper labels applied with a starch paste prepared with minimal water, successfully adheres to most leather, Native tanned hides, tapa and baskets. This works well unless the hide is extremely oily. The paper adheres best if it has been wet torn, not cut, making the edges fibrous. Labels can also be sewn onto a woven textile in good condition. DO NOT SEW a label onto leather, hides, brittle textiles or baskets. Sewing into these artifacts creates irreparable holes and tears. Use a nonadhesive cotton tape or Tyvek and as few stitches as possible. Do not knot the sewing thread, attach it by looping through itself on the label, before sewing into the textile. In rare instances, less damage is caused by writing a catalog number directly on the surface of an object than applying a number to a barrier coat. A soft pencil (#2 or HB) is recommended for marking the reverse of a paper object. Write in an unimportant area and do not press hard enough to create indentations. If the paper is soft, like crepe paper used for Buddhist funeral figures, use a softer pencil. Plastic objects should have nothing applied to them. However, if staff insist on applying numbers, write directly on plastic objects with a fine wax pencil, a water soluble All-Stabilo pencil, or acrylic paint applied with a fine brush. Do not apply the number near important manufacturer marks in case the number precipitates surface damage. The number may become irremovable with time. (1) Clear nail polish has poor aging properties because its primary ingredient is cellulose nitrate. It stains and damages surfaces as it yellows and darkens. It eventually peels off. Despite these problems, nail polish continues to be used by many museums because it is easy to obtain and to apply. It is not recommended for use because it will damage your collection. (2) Acryloid/Paraloid B-72 resin has the best aging properties of any barrier coat material. It is usually used as a 25 % solution (weight to volume) in acetone, toluene, a mix of acetone and toluene, or ethanol. The solvents will damage plastics and painted surfaces. This material will be absorbed into porous surfaces and will be difficult to remove completely. It has poor working properties: it becomes gummy and stringy requiring the addition of solvents. Many catalogers complain that it requires a long time to dry (toluene releases gradually from this resin), and high relative humidity may affect its properties. Acetone solutions often bubble, making them impossible to write on. It forms a brittle barrier film. If used in unventilated areas, the solvent fumes, especially toluene, are a health risk to the cataloger. Because of all those factors, use Acryloid/Paraloid B-72 only on unpainted, non-porous surfaces in well-ventilated rooms. Place the solution in a brush top bottle, such as an empty, clean nail polish bottle, for easy application. If it bubbles, use a slower evaporating solvent in the solution, such as toluene. (3) Acryloid/Paraloid B-67 resin will yellow slightly with time. The resin dissolves slowly in Naptha, mineral spirits, Stoddard solvent, petroleum benzine, or white spirits (all similar petroleum distillates). These solvents are less likely to solvate painted surfaces. They will dissolve oils and waxes. The resin has better working properties than the Acryloid/Paraloid B-72 resin, however there have been some complaints about slow drying. Typically, the barrier coat dries within minutes. The barrier coat will be difficult to remove - it does not rapidly dissolve in any solvent. But it will eventually dissolve in one of the solvents mentioned above. As with Acryloid/Paraloid B-72 resin, the barrier film is brittle. TEST first, before using Acryloid/Paraloid B-67 on painted or unpainted non-porous surfaces. Do not use on wax figures. Again, apply only in a well-ventilated room. (4) Poly (vinylacetate) (PVA) Emulsions & Acrylic Dispersions will yellow with time. Some 10 years old samples are quite yellow. Because they are water-based barrier coats, they are the healthiest to use . But water may damage or stain many organic materials, so use these materials judiciously. The PVA makes a flexible coating that works well on flexible objects. PVA's, however, have a low glass transition temperature and may cold flow or become tacky in warm climates. Therefore, these resins are not recommended for numbering objects in the tropics. Commercial PVA 's have unknown additives, altering their aging properties. Acrylic dispersions and emulsions will yellow slightly. They make more brittle films than PVA's and have higher glass transition temperatures. Many commercial acrylic emulsions, such as acrylic artist's medium, have ammonia additives that will damage metals. Acrylic gloss media have fewer additives and should yellow less than a matte media. One benefit of matte media is that it creates a slightly rough surface on which a pencil can be used to write the catalog number. When you have a choice, use an acrylic dispersion rather than a PVA and apply to non-porous, non-water sensitive materials. Remember, although these resins are applied in a water solution, they require solvents for their removal. Do not use them on surfaces that will be damaged by solvents. (5) Aquazol (PEOX Dow Chemical 2-ethoxy-2-oxazoline), is a water-based removable barrier coat. It is soluble in water, methanol, ethanol, acetone, propylene glycol, methylene chloride and MEK. Aquazol is not recommended if water damage is a threat to your object. It may work well as a topcoat or in certain situations were solvents cannot be used. Recently introduced to conservators, investigations continue on this material. Catalog numbers can be applied to objects with a quill pen, a fine brush, or an empty felt tip marker (TRIA by Letraset). All three require practice and skill. The quill pen may scratch a surface because it has a metal nib. The brush is the most difficult to use, but the softest for artifact surfaces. The TRIA marker is an empty felt tip pen with three different nibs designed for use with dye-based inks. Unfortunately, pigment-based inks, which are more light stable, will clog the felt. When the TRIA marker works, it works well. Otherwise, it is frustrating to use. The fine quill pen works best if the cataloger is experienced in its use. I do not recommend drafting pens; a common brand is Rapidiograph. These metal pens scratch surfaces, clog often and their ink formulations vary. After the pencil, the second best writing material is carbon black acrylic paint or ink with tested aging properties. For a white ink, use rutile titanium dioxide pigmented white acrylic paint. Do not use an ink unless you know it is acrylic and pigment based. "India Ink" formulations vary from manufacturer to manufacturer and often contain dyes. For tags, use dark pencil or a light-fast felt tip pen, as noted below. If the collection is wet, tags numbered in pencil last longest. Commercial felt-tip pens are occasionally used to number objects but they are not recommended. When you use them, you have no control or knowledge of what you are applying to an object. Ink formulations change without notice, and each ink contains a soup of chemicals: solvents, binders, dyes and pigments. Solvents may migrate through a barrier coat, many dyes will not survive light exposure, and binders may form acidic byproducts as they age. Only the pigments, if they are present (few felt tip pens use pigments because they clog the felt applicator), will survive. That said, the two most commonly used commercial pens are Sharpie and Pigma pens. Never use these pens to write on barrier coats or directly on object surfaces. Pigma pens will not write well on plastic substrates, including the barrier coat resin. Both work well on tags. Test their light fastness by writing on a piece of Tyvek and clipping it to a clothes line for three months in the summer. If the writing survives, it should stand the test of time. If you choose to use a white patch with black numbering ink instead of white lettering on a dark object, use the same white acrylic paint mentioned above and apply it on top of the base coat. Never apply white acrylic paint as a base coat. Do not use commercial products, such as White-Out, for a white patch. Many of these products age poorly and formulations change without notice. Alternatively you can prepare your own white patch material using rutile titanium dioxide pigment, toluene, and 25% Acryloid/Paraloid B-72. Again, always apply the white patch on top of a clear base coat. Finally, choose someone with good, clear handwriting to write your catalog numbers. This may not be your registrar. Be honest, it is important that these numbers be clear to future staff, too. Some museums protect the applied catalog number with a second barrier coat. The theory is that this will prevent the number from abrasion and loss during normal wear and tear of object handling. Top coats and base coats may be different. In fact, I suggest that the materials used to apply the catalog number and the top coat dissolve in the same solvent while the base coat is unharmed because it dissolves in a different solvent. This allows a catalog number to be reapplied without stress to the object. Oily wood: (1) Tyvek tag with teflon tie preferred. Whatever techniques you use, consider it to be a micro-conservation treatment. Record on your accession cards exactly what materials you used and where you used them when labeling the item. And, if you know, record how it can be removed. Your successor will thank you years hence. Special thanks to Ruth Norton, Lori van Handel, Gayle Clements, Marianna Munyer, Terri Siegel, Terri Schindel, Julia Fenn, the Canadian Conservation Institute and UK’s MDO. The information in this article is the result of work by many individuals and organizations over the past ten years. 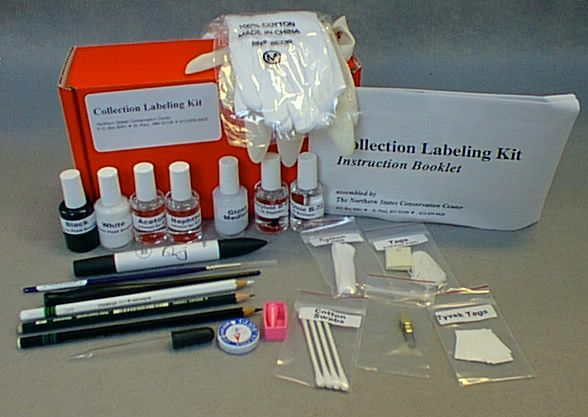 Collections Labeling Kit Based on work by the AIC/AAM Joint Committee on Numbering, this kit provides three ½ ounce brush top bottles of different clear lacquers, two bottles of solvents, and bottles of black and white acrylic inks. Included are three different ink applicators: a fine brush, a quill pen and an empty COPIC marker. Three different pencils, two that are water soluble, samples of different tags and ties, and gloves also are included. A small booklet provides information on how to use each of the items in the kit. Collections Labeling Kits are a popular item. Because of the number of components in the kit, and its popularity, we can't always predict accurately how much material we should have in stock. We regret that there may be a shipping delay of 2-4 weeks if we run out of kits or any of their components. We try to make sure this doesn't happen, but please be patient with us if your order takes longer than expected. COPIC Empty Marker An empty felt marker with replaceable nibs. Created for dye-based inks. One end is Fine Line and the other is the standard Chisel end. All-stabilo pencils Water soluble pencils that write on most surfaces. Recommended for writing directly on plastics or on the back of plastic-coated photographic papers. Do not stack photographs on top of each other; writing may transfer. Use a separator of glassine or acid-free paper. Will write on metals, glass and ceramics without a barrier coat, too, although this is not generally recommended. Writes well on Acryloid B-72 and Acryloid B-67 base coats. Do not use a top coat as it solubilizes in most liquids. Pigma Micron Pen, .25 mm, is a fine point writing instrument offering a waterproof, quick-drying pigment ink. Fade proof and smudge proof on porous surfaces, including 100% cotton fabrics. Will not smear or feather when dry. Fade resistant. Does not bleed through most paper. Use for writing on paper tags and cotton twill tape. Does not write on plastics, so will bead and smear if used to mark on barrier coats applied to objects. Never use to write directly on objects or archival materials. pH neutral and chemically stable. Ideal for acid-free environments. Excellent for non-museum collection purposes such as graphics, journaling, scrapbooks, memos, illustration, drafting, archival recording, cartooning, and accounting.